You are currently browsing the category archive for the ‘legumes’ category. A few warm days and the overwintered parsley is sending up umbrels, those harbingers that the end is nigh. It was time to shift into a mindset of abundance, a sudden and welcome transition after winter’s scarcities, kale notwithstanding. In fact all of the herbs are growing at top speed these days, and standing in the backyard garden my thoughts jumped right to the Mediterranean — a plate of falafel, creamy with chickpeas and green with parsley, eaten with a minted yogurt, since there’s no scarcity in that department either right now. Add in herbed meatballs mixed with parsley, mint, and oregano, plus a salad of arugula and baby greens, and you’ve got a nice little dinner on your hands. And one that’s pretty darn local, if I do say so myself. But the cooking wasn’t quite as easy or smooth as my imagination made it out to be. On first go ’round, I found that frying falafel was like frying ice cream; they just melted into the hot oil. A bit of internet research led to an overnight chill for the falafel batter plus a deeper pot of hot oil, and voila. By then dinner was just a memory, but the falafel balls made a lovely lunch tucked into a pita and eaten, you guessed it, with more minted yogurt. Combine first 7 ingredients in a food processor and process until pureed. Add bean liquid sparingly if needed. Stir in salt, pepper, and lemon juice to taste. Chill for at least one hour. Heat 2 inches of oil in a heavy pot to 350 degrees and maintain at 350-375 degrees. Alternately, a bit of batter dropped in the oil should sink to the bottom then rise. Form falafel mix into 1½-inch balls. Mix should not stick significantly to your hands. If it does, add flour by the tablespoon until stickiness goes away. Roll balls in flour, then drop in hot oil and cook until golden brown, about 4 minutes. Serve right away. Feeds 3-4. Mash garlic and salt into a paste. Stir together with yogurt, mint, cayenne, and refrigerate for at least half a hour before serving. I like beans, I really do. Every January I resolve to eat more of them, but it’s so easy to get stuck in a rut. You do the pintos with Mexican food, white beans for French or Italian soups, and you cook with summer savory, the so-called “bean herb” when you’re stumped — though I can’t say the stuff does much for me. That’s why it’s so exciting to find that chickpeas, aka garbanzo beans, have so much more to offer. A couple months ago I bought a sack of dried from Alvarez Farms, and I love just how many options there are with these guys. Toss with basil for a cool summer salad. Mash with parsley to make falafel. Braise with ginger and cilantro, or with leeks. Cook quickly with fried sage, then toss with olive oil and a bit of garlic — they’re tasty over chunky pasta, though not everybody agrees on this last point. And they taste different every time. Not to mention that they’re amazing cooked down with pork fat, but let’s go there some other time. One especially easy preparation is this Jerry Traunfeld special, where the chickpeas are fried quickly with rosemary and sea salt. They come out crunchy, salty, and yes, delightfully savory, a perfect way to start a meal. Heat 2 tbls olive oil in a heavy skillet over medium-high. When oil is hot, add chickpeas and cook, stirring, for several minutes. The skins should start to brown in places. 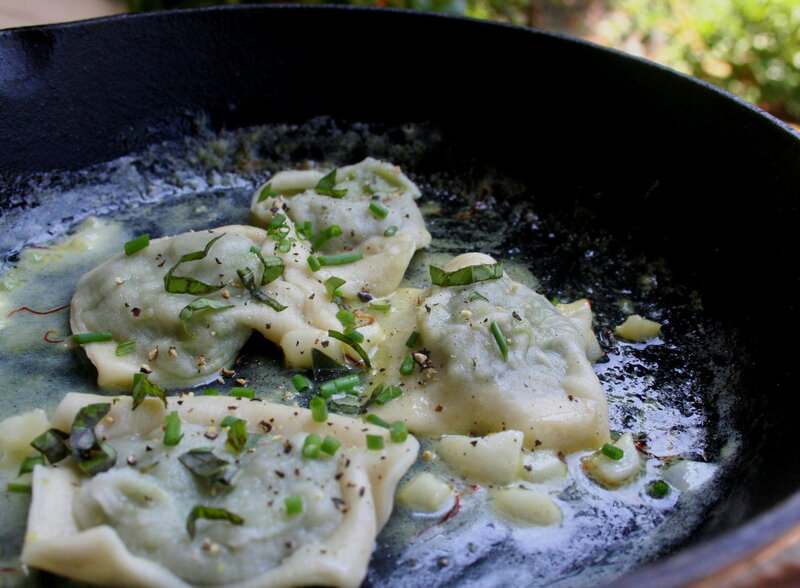 Sprinkle with rosemary, garlic, sea salt and pepper and continue cooking about 2 minutes more, then drain and serve. Adapted from Jerry Traunfeld. My friend Alice called to report that she’d just been to the Columbia City farmers market, where her pickings included cherries and strawberries. “Local fruit is back!” she said. She was making strawberry shortcake for a dinner party we were both attending, a line of thinking that I readily encouraged. She told me she’d spotted fava beans at the market. “I wasn’t really looking at them,” she said. I considered driving out to Columbia City just to see what a harvest-sized pod should look like but only made it as far as our community garden. In our absence the patch had become overrun by fava plants, which were weighed down with swollen pods. Faithful readers may remember I planted these cold-weather legumes months ago, hoping the beans’ nitrogen fixing capabilities would replenish the soil. The strategy seemed to be working; adjacent chard and scallions were twice the size of more remote counterparts. The original plan was to grow favas not just for the nitrogen but for the beans themselves, a two-fer, but it’s been such slow going that recently I considered tearing the plants out to make room for summer crops. It being summer and all. Yesterday, though, some pods seemed ripe so I broke one open. The beans were about the size of a penny and encased in plush, velvety padding. I picked the biggest pods then headed home to do some research. There was a big haul coming, if I could just stay patient, and I wanted to be prepared. I’d only eaten these things fresh once before, served with rabbit-stuffed ravioli at Union, and needed something simpler. Cookbooks recommended mixing them into stews or mashing them on grilled bread. Fellow bloggers were more inventive. Poppy at Mixed Greens had created a good-looking fava puree with herbs, and Hank at Hunter Angler had several helpful posts about the beans from earlier this spring. In the end I opted to eat them plain, which is to say blanched, skinned, and mixed with olive oil, salt, and pepper. The prep went sort of slowly but seemed like something that could go more smoothly with practice. I sampled the thick skins, which are said to cause gas, and the taste was reminiscent of edamame. The beans themselves had a faint bite like lime zest and a nice watery quality. But I’m still not sure what to do with the imminent harvest … I’m open to suggestions. The temperature hit ninety degrees yesterday, just right for burgers and beers with friends. Our plan also called for a garden salad plus homemade baked beans, but who wants the oven on all day when it’s so hot out? Here was the perfect opportunity to check out the concept of the hay box cooker, which is said to work like a no-energy Crockpot. 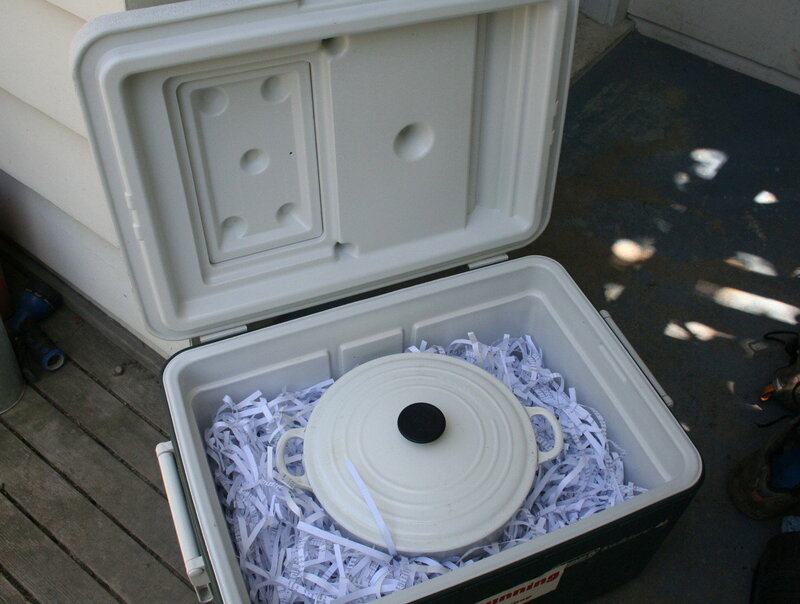 Mine wasn’t elegant: I’m talking about a cooler insulated with crumpled newspaper, styrofoam scraps, and shredded paper, with a Dutch oven nestled at the center. The setup maintained heat relatively well, though there’s definitely room for improvement. Time cooked the beans to tenderness — but I ended up finishing them in the oven, to thicken the sauce. They came out wonderfully hot, sweet and spicy, a perfect way to anticipate summer. Boil 6 cups of water in a small Dutch oven or equivalent pot. Add beans, turn off heat, cover, and let rest for an hour. Add one half-onion, cover, return to a boil, then simmer on low for another hour. Remove onion and discard. Whisk together molasses, 3 tbls brown sugar, mustard, 2 tsp salt, the peppers, and ½ cup of bean cooking liquid. Pour mixture into pot and stir. Pierce remaining onion half with cloves and submerge. Add the whole chunk of cured pork. Bring beans to a fast boil. Cover pot tightly and boil on high heat for several minutes, then carefully place pot in hay box cooker. Leave undisturbed for about eight hours or until beans are very tender. Alternately, bake for five hours in a 250 degree oven. Remove onion half and correct seasoning if desired before serving. Feeds 6-8 as a side dish. A few weeks ago, I noted that our humble state grows lentils by the ton and ships ’em everywhere in the world except to our farmers markets, where there are none to be found. 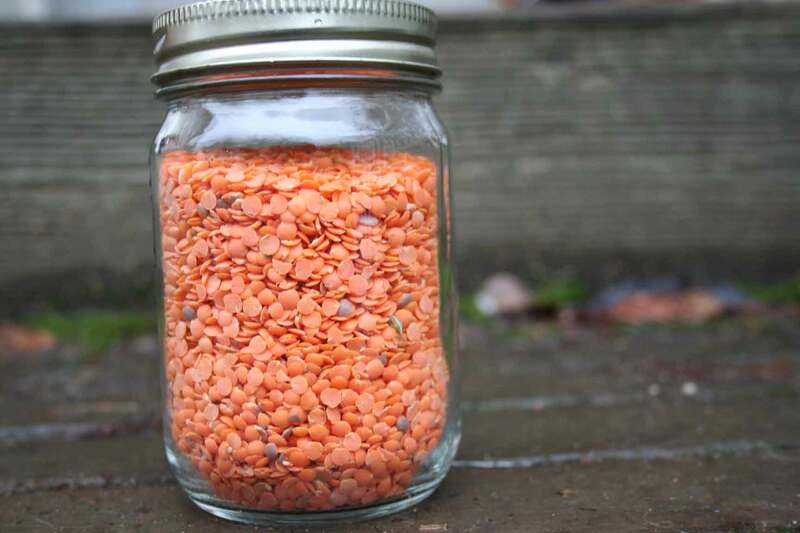 I’ve learned more about lentils in the interim, including that intrepid local eater and world-class vegan Scott Jurek sometimes purchases them from Mabton-based Alvarez Farms. If you’re so inclined, Scott thinks it’s worth asking Alvarez to grow lentils again this year, and all the better to ask before growing season begins. Fully one of every three lentils in this country is grown at the eastern fringe of our humble state, in a region known as the Palouse. This rich and hilly patch of loess is a four to five hour drive from our doorstep, depending on how fast you take the town of Colfax, Wash., pop. 2700, reputed to be a big-time speed trap. It’s a fair drive from here to there, but one that some growers do on a weekly basis to get their meats and specialty goods to the Seattle-area farmers markets. And yet, you’ll never find lentils at these very same markets. Why is this? 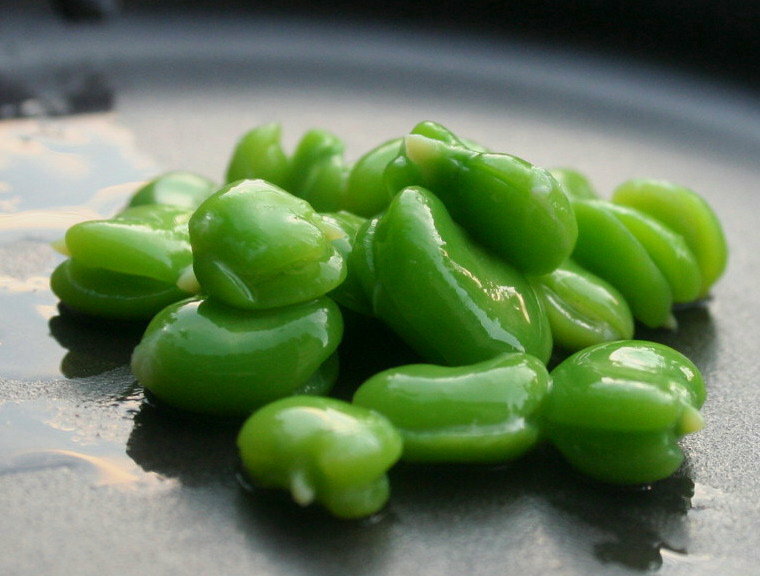 We’re talking about a near-perfect protein, a legume that delivers tons of folic acid and fiber. And lentils are dry goods, which means they ship light and can store for long periods of time; they might just be the ideal national security food. 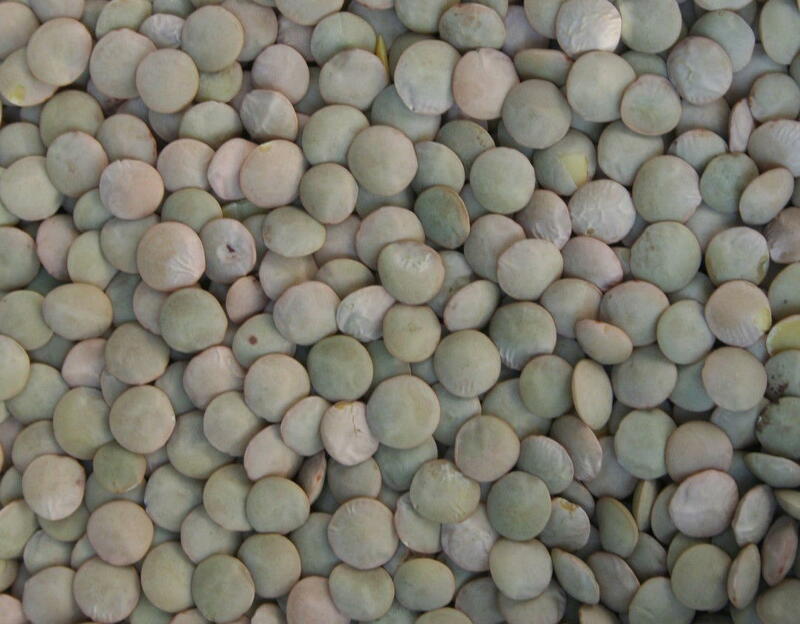 But it happens that all in-state lentils are grown on a contract basis; large corporations provide farmers with their seeds and buy back the product. No doubt the system is efficient, but we pay a certain price; as of Y2K, for example, our state’s lentil growers had exhausted the efficacy of dithiocarbamate and organophosphate insecticides for their crops. See a newer post for additional details. I bring up lentils at all because for dinner tonight I cooked up a pot of Melissa Clark’s lentil soup from yesterday’s NY Times. This soup was full-bodied, savory, and absolutely delectable with fresh bread, which I baked according to Jeff Hertzberg and Zoe Francois’ 5-minutes-a-day method and ate hot out of the oven smeared with fluffy goat cheese. (Disclaimer: Jeff and Zoe suggest letting the loaf cool before tearing it apart.) It was filling enough for an entire meal, and I’m no bantamweight when it comes to eating. Update: I made a modified batch of this soup for an herbivorous crowd and it was a hit. Here’s my adaptation of the recipe. The small, split red lentils are a key ingredient, as is the yogurt, which adds a nice hit of acid. Heat 1 tbls oil in a soup pot over medium-high. Add onions, garlic, and carrots and cook until soft, about 5 minutes. Add tomato paste, cumin, and chili powder or cayenne and stir until fragrant, about 2 minutes. Add broth, lentils and ¼ tsp salt. Cook 45 minutes, or until lentils are tender. Puree half of soup and recombine. Season with additional salt and pepper if desired. Garnish with a scoop of yogurt and sprinkled herbs. Feeds 4. Stores well. Adapted from Melissa Clark. Note: alternately use 1 tsp lemon juice, stirred into soup, instead of yogurt. I’m smitten. I’ve been experimenting with chickpeas ever since obtaining a supply from Alvarez Farms in October, and the possibilities would seem endless. More than what one can coax from the average legume, anyway, and not just because this one has two proper names, the garbanzo bean being its alter identity. The wide selection of eats that involve chickpeas has something to do with just how well chickpea flesh pairs with various herbs and spices. Beans are traditionally said to partner with summer or winter savory, an herb towards which I have feelings of relative contempt. Chickpeas range more broadly. In recipes we’ve tried recently, they pair nicely with basil and cilantro for salads, parsley for falafel and hummus, with ginger or chilies in Moroccan stews, with fried sage over pasta, and crisped with rosemary. Surely the French do something with chickpeas and thyme. And then there’s the whole chickpea and pork situation. A friend loves them cooked down with leeks and bacon. Me, I think they’re most deluxe stewed with pork ribs, sausage, and paprika. For all I know, they’re probably good for you too. Who’s counting the pork? Drain chickpeas well. Heat olive oil in a heavy skillet over high heat. When hot, add chickpeas and toss with salt. Cook on high heat for 6-8 minutes, until skins are crispy and starting to brown. Add pepper and rosemary, toss, and serve as an appetizer. Adapted from Jerry Traunfeld. The night before, soak chickpeas in ample cold water until you’re ready to cook. Separate rib rack into individual ribs and sprinkle lightly with salt and pepper. Cut pork belly into half-inch dice. Heat large heavy stew pot over medium-high heat. When hot, add vegetable oil or lard and swirl to coat pan. Add ribs and pork belly in a single layer and brown deeply, about 5 minutes per side, then remove from pot. Continue until all meats are browned. Pour out rendered fat and reserve for another use if you wish. Turn heat up to high. Add the chickpeas and browned meats plus all remaining ingredients except chorizo. Add stock, scraping up brown bits on the bottom. Liquid should cover ingredients; add water if it doesn’t. Turn heat down to low, cover, and cook for two hours. Add sausages and cook with the lid ajar for another 45 minutes or so, until meat is falling off the ribs. Remove onion, carrot, and garlic cloves and puree in a food processor. Return mixture to pot. Sauce should be slightly thickened. Remove bay leaf and serve over rice. Feeds 6-8. We dipped into our supply of pinto beans from Alvarez for this hearty meal, and his tasted fresher and more toothsome than those from the grocery store, which lose texture while sitting in storage, sometimes for years. I’d bet good money that most folks could tell the difference in a blind taste test. In fact, the beans were the star of the meal, never mind my efforts to gussy up the rice with carnitas and roasted poblano chilies. A salad of greens, radishes, and carrots rounded things out. Mostly local, 100% deluxe. 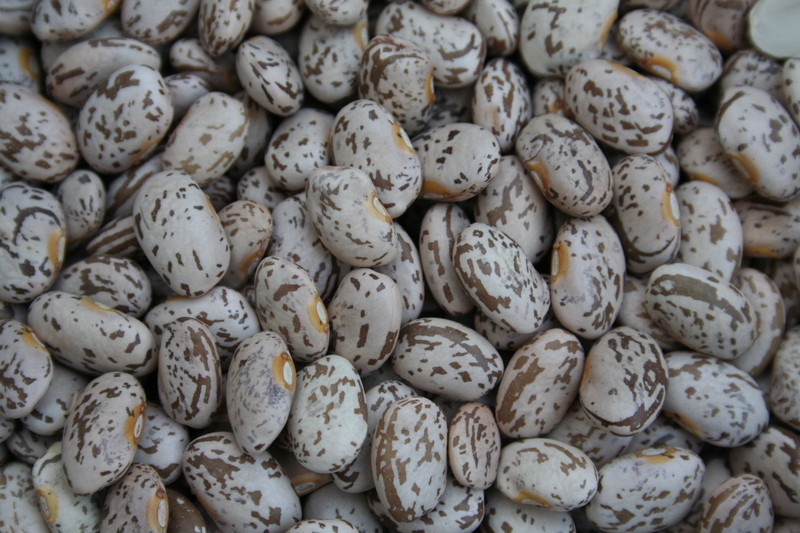 Rinse beans, place in pressure cooker with about 6 cups water, and cook under pressure until tender, between 20 and 30 minutes depending on freshness of beans. Cool. Alternately, cook beans for 1½ hrs in a regular stovetop pot. Crisp bacon in a separate 5-quart pot until fat is rendered, pour out most of bacon fat and drain bacon strips on a paper towel, then chop. Saute onion and jalapeno until soft, 8 minutes. Ladle pintos plus some of their cooking liquid into the pot with onions/jalapenos and cook until flavors are combined, about 20 minutes. Season with salt & pepper. Stir in tequila and garnish with cilantro or scallions and crumbled cheese. Serves 3-4 as a main dish served with rice and salad. Adapted from Rick Bayless.